Preheat oven at 200oC in convection mode. Place a sieve in a bowl & add maida, baking powder and baking soda. Sift all these dry ingredients to mix well. Take a cake tin (small) and smear ghee on the sides and bottom of the tin. Sprinkle some maida in this prepared cake tin and tap it turning to coat it. The maida gets stuck to the ghee and works like a butter paper. 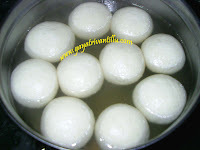 In a mixing bowl add sweetened condensed milk, essence, melted butter, sifted dry ingredients and water. Mix all well till there are no lumps and the batter is smooth. Pour this cake batter in the prepared cake tin and place this tin in the preheated oven. Bake the cake at 200oC in convection mode for 25 minutes. Temperature and timings differ from oven to oven. So keep watching while baking. To test the doneness of the cake, insert a tooth-pick in the cake. If the tooth-pick comes out clean then the cake is done. If some batter sticks to the tooth-pick then bake the cake for some more time. Here it took me 22 minutes to bake the cake. When the cake is done remove the tin from oven. After 2 minutes, turn the cake on to a wire rack and cool completely before icing it. Place a fine sieve in a bowl and add powdered sugar and corn flour. Sift the two ingredients to mix well. The icing for this cake should be smooth so remove any granules in the powdered sugar by sifting through a fine sieve. Measure 85gms of the prepared icing sugar and keep it aside. In a bowl take unsalted butter which is at room temperature. Beat with a spoon to make it soft and creamy. Do not warm the butter to soften. When the butter is creamy add icing sugar little by little and mix. Slowly add the icing sugar to the butter. When all the icing sugar is incorporated into the butter mixture add essence and mix well. The icing is ready to decorate the cake. The prepared icing may be spread on the cake and smoothened to decorate the cake. To make it more attractive use icing syringe, with different nozzles. Fill the syringe with the icing and fix a nozzle of your choice and pipe it along the border of the cake. The icing forms a decorative lace to the cake. Further garnishing with cherries makes the cakes look and taste more attractive. Serve the eggless cake to your family members. Bake the cake in convection mode only when using aluminum tin. Greasing & dusting the cake tin will make the baked cake detach from the tin. See that there are no lumps in the cake batter. Keep a watch while baking as temperature and timings differ from oven to oven. Use unsalted butter which is kept at room temperature. To prepare soft icing sift the powdered sugar to remove any granules left in it. Add icing sugar to the creamy butter little by little. For a firm icing add some more icing sugar (around 115gms). Decorate the cake using icing and enjoy the fresh, fluffy and tasty eggless cake. Thanks for your wonderfull and simple marble cake recipe. Definitely you can adopt that method. It would give a beautiful design. Have a doubt about baking dishes...where we can find these aluminium baking dishes in this hyderabad? any idea? you used a square baking aluminium dish to bake pav. I want to buy that. Please let me know asap through my id andhraspicy@gmail.com. Hi gayatrigaru and Sridevi garu! thanks a lot for your helpful information. So thankful to u. And one more doubt gayatri garu! heard that aluminium baking trays are not to be used in convection oven...is it right or wrong? I am a Bank officer by profession but i am very passionate for cooking as I have already mail you regarding failure of mine regarding baking of cakes. Also I have very little time for experimenting the things so i want to purchase an OTG or Electric cooker for baking. would you please suggest me to take which and of which brand or you suggest me any brand of microwave oven. As i am very eager as you well know from my last mail. thax a lot. It seems you are very much upset about the cakes outcomes. Often while experimenting we tend to prepare with small quantity and put it into a large baking tin!!! This turns out flat crispy cookies. 1 cup in your recipes is 100 ml right? Please clarify. 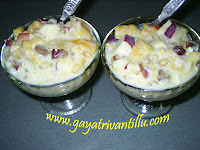 Nenu mee cake recipes anni try chesanu.Chala baga vachhayi.Naaku oka chinna doubt undi. Oven Convection mode lo steel vessels use cheyyochha? Steel vessels can be used in convection mode. In fact I showed them in my banana cup cakes. Remember not to use the cake mode option in which micorwave also comes to be used. Eggless vanilla cake recipe lo measurements gms basis payna kakunda, cup tho measurement cheyacha. for ex: 1 cup maida ki entha cup condensed milk, thesukovali. endhuku ante gms lo measure cheyali ante theliyatledhu. cooker and normal oven . i dont have convenction or otg. It would be nice if people leave their names also while Blogging, so that I can address them and answer. I havent tried baking in other than OTG and Covection oven. Hence I cant guess. How are you.I tried your receipe of Eggless vanilla cake.It has come out really good.My friends said that the cake is not tasting like a home made cake.I was so happy with the complememt and i shared your website with all of my friends. Thanks a lot for the receipies and showing the simplest procedure of them. Hi, i want to prepare a simple cake can you please mail me the recipe and mine is an Electrolux microwave oven , so can you tell me in what mode and in which temperature it should be prepared.. 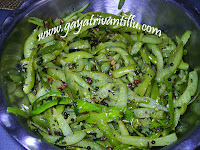 Thank you for having the recipes in English as well because I am sure that many people who don't follow Telugu can get extra tips by reading the Engligh version. In my case, I am married to an Andhraite but I am from Kerala and dont really follow Telugu. I visit your website regularly. Hope I can impress my in-laws when they visit (we are in US). i dont know that which language u were explaining the recipe for this cake but i really﻿ appreciate it cos it is a really an easy recipe i ever came to know.........thanks alotttt.